A Classic Colonial home's remodel looks as good as new but remains historically true. Sometimes a home needs a facelift to freshen up, but with so many facade-fixing options, it’s hard to know where to start. 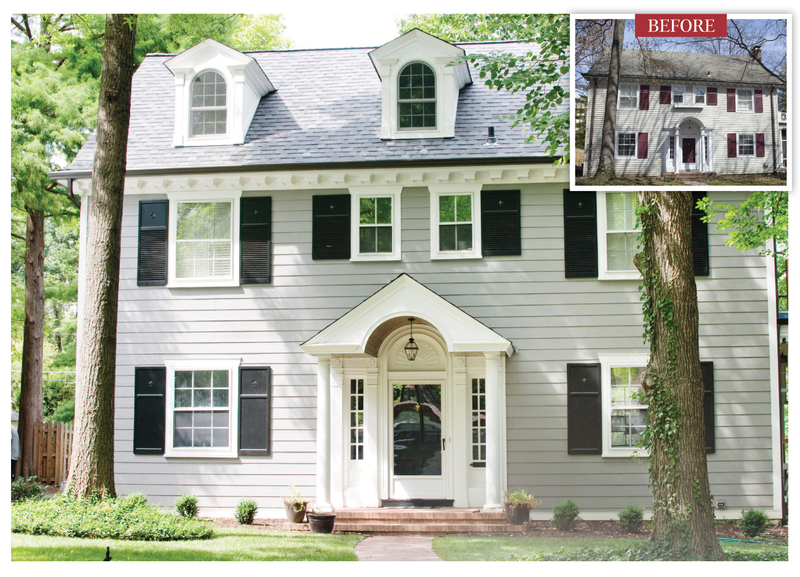 When the Clayton homeowners reached out to Lakeside Exterior about the dated exterior on their 100-year-old home, it was time for a makeover. They knew they wanted dormers, but they didn’t know how many. They knew they wanted a front porch, but they didn’t know how to go about it. Lakeside Exteriors’ in-house designer John Bush, with the help of John Littlefield of Littlefield Architecture, worked with the detail-oriented homeowners to formulate what the future held for the classic colonial home. “We wanted to preserve the historical character of the house, so we tried to work with what we had,” says Bush. “The inside is very well preserved and it’s very classic, so we wanted to keep it classic.” The home’s original fleur-de-lis crested shutters were cleaned and painted black for a crisp contrast against the new custom gray-colored James Hardie fiber cement siding. In a neighborhood that no longer allowed vinyl siding, it was necessary to strip the home of the weathered white-vinyl siding and the old, deteriorated Lycra siding underneath. Yet they still kept many more of the home’s historic touches, cleaning and repainting the plaster shell-like ornament over the door, the door itself, the round trim and the Federal-patterned embellishment directly below the edge of the roof. Even with the original accents freshly remodeled, the homeowners were ready to add something new. Several concept drawings later, they decided to add three custom, triangle-tipped dormers with oval-topped windows. Being true dormers, the additions let natural light seep through the windows into the interior and onto the complementing window seats. Lakeside Exteriors structurally reinforced the roof so it could carry the weight of the dormers. They also resurfaced the faded roof with “high-end asphalt shingles in the Camelot pattern because they are thicker and meant to look like older styles,” says Bush. “Like mascara or eyeliner on a girl,” they used the black on the shutters and the dark roof to highlight the details of the homes crisp, classic beauty. The original front facade was a little flat before the remodel. “We wanted to give it some depth,” says Matt Merrifield, owner of Lakeside Exteriors. “That’s where the front porch came in.” The once crowded, column-confined porch was widened into a larger walkout with full front-door coverage from the weather. Bricks were salvaged from the back yard to create the porch’s base and the curved ceiling was retained. The new columns were modeled to look similar to the old, conserving the classical look of the original porch.